MELLOW YELLOW: Jaime Holm’s vintage trailers offer some color and personality to just about any event, from camping to a wedding. Whether you’re looking to plan a retro-style campout with some friends and an ice box full of cold ones, or you’re trying to put together a caravan for your traveling carnival-themed wedding, a new vintage trailer company has got you covered. Tinker Tin Trailer Co. offers rentals of traveler trailers for camping, weddings, parties, and other events, and will even deliver them where you need them to be, set them up, and pick them up when you’re done. 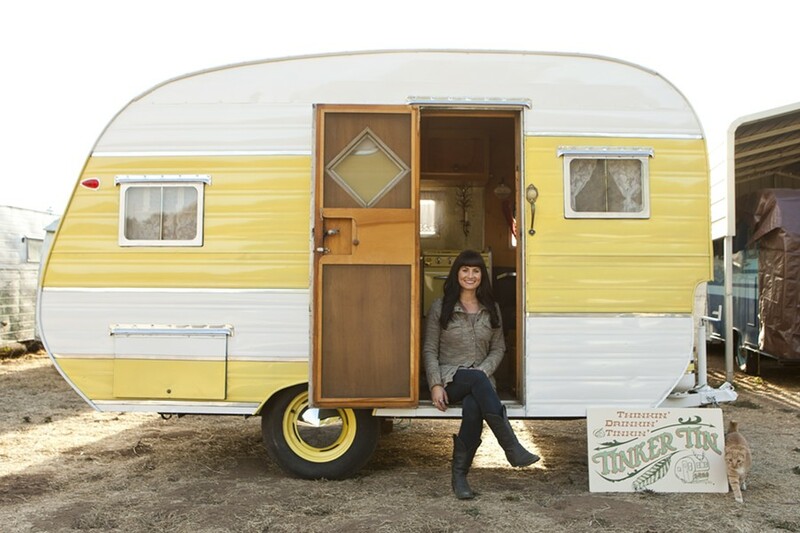 “It’s what I like to think of as a little boutique hotel room on wheels,” said Jaime Holm, Atascadero resident and owner of Tinker Tin. All of Tinker Tin’s trailers originate from the late ’40s to early ’60s and are of the “canned ham” variety, a name that stems from their resemblance to the said food product. After purchasing the trailers, Holm and her husband do the restorations, keeping some of them period accurate while giving others a more modern twist. One of the trailers is even set up with a photo booth inside and comes stocked with a variety of costumes that can be worn to help guests create a memorable memento. The interior of the trailers varies, but they all feature a kitchen and dining area, and beds with Tempur-Pedic toppers for extra comfort. Tinker Tin will even help you with your outside-the-trailer experience by providing items such as chairs, an awning, a portable propane stove, cookware, utensils, and a percolator for hot coffee. The name “Tinker Tin” is derived from Disney’s 1953 interpretation of author J.M. Barrie’s Tinker Bell character from the play Peter Pan. “Tinker Bell was a little pistol. She had sass and attitude, and was always living a life of fun and adventure! My little tinkin’ trailers are here for the same purpose,” Holm writes on the Tinker Tin website. “Tinker Tin” is also a reference to the traveling tinsmiths known as “tinkers”—tin being the same material used in manufacturing the trailers. Holm views Tinker Tin as an embodiment of her interests and life experiences. Memories of camping with her family as a child, a passion for interior design she inherited from her grandparents who run a furniture store in Morro Bay, her travels around the world—part of which she experienced as a competitive surfer—all coalesced into the inspiration behind Tinker Tin. “Looking back … I should have pictured this was going to be what I was doing with my life,” said Holm. Rental prices for the trailers are $150 per night for camping within SLO County, with a 2-night minimum, $1,000 for weddings with the photo booth trailer, and $500 for weddings without the photo booth trailer. Prices for other events are handled on a case-by-case basis and gift cards are available. For more info, contact Tinker Tin Trailer Co. at 458-8010 or visit tinkertin.com. The results are in for the SLO Downtown Association’s 2013 Window Decorating Contest. The theme this year was “Get your Holiday Shine On” and the winners are as follows: First Place: Ambiance; Second Place: B. Anthony & Co. Jewelers; Third Place: A Muse Gallery; Best in Theme: Jules D.; People’s Choice: The Bladerunner; and Honorable Mention: Cal Poly Downtown and EcoBambino. Intern Trever Dias compiled this week’s strokes. Send your business and non-profit news to strokes@newtimesslo.com.